In preparing for the show, I realized that, despite the wishful thinking of pundits who -- as they have prior to so many elections in past years -- predict that a "third-party moment" is upon us, owing to the deep dissatisfaction of American voters with the two major parties, the Democrats and Republicans. What has sparked this latest round of prognostication was the "dysfunctionality" perceived in the long congressional debate about raising the debt ceiling, an issue that has largely gone unnoticed in the previous dozens of times it's come under legislative consideration. What I found out is that there are only about a dozen third-party and independent candidates for the 140 seats up for election in the General Assembly -- 100 in the House of Delegates and 40 in the Senate. I also discovered that the majority of those seats will be fully uncontested -- there is only one major party candidate in 62 of the House elections and in 15 of the Senate elections. If there were really a strong desire for third-party representation in government, we would see demand for third-party and independent candidates to emerge in this year's Virginia elections. But we don't see that. This is all a long way of getting around to pointing out that, once I got my thoughts in order, I put them on paper and submitted them as an op-ed to the Richmond Times-Dispatch, which published the piece in Sunday's commentary section under the headline, "Third-party resurgence seems unlikely". Because Virginia holds its state elections in odd-numbered years, out of sync with most of the rest of the states, it is widely seen as a bellwether of the country's political mood. In 2009, for instance, Republicans swept the top three statewide offices here, anticipating the landslide return in 2010 of a GOP majority to the U.S. House of Representatives. Four years earlier, Democrat Tim Kaine won the governor's mansion, followed in 2006 by the Democratic Party regaining control of both chambers of Congress. In 1993, Republican George Allen's come-from-behind victory in the governor's race portended the first GOP takeover of Congress in 40 years. If the electorate's mood really favors a third-party surge, we would be seeing it in Virginia. There would be a demand for third-party and independent candidates for the General Assembly, and candidates would rise to meet that demand. Yet according to records available through the Virginia Public Access Project (VPAP), there are only seven independent candidates seeking election to the 100-member House of Delegates this year. There are four independent candidates for the 40-member state Senate. Check out the Times-Dispatch today at your local newsstand or look it up online. Comments and questions are welcome, there or here. I just hope that nobody thinks the photo accompanying the article in the RTD is a picture of me. 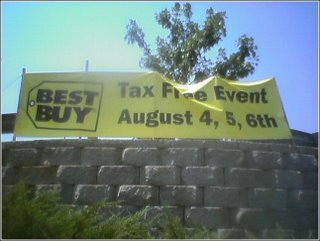 In 2006 and 2008, I wrote blog posts about Virginia's tax-free holiday for back-to-school shoppers. The first such holiday was in August 2006, which means that this year's "celebration" is the sixth consecutive one. The article caught the attention of Jim Hanchett, news director at CBS19 TV in Charlottesville (part of the Charlottesville Newsplex, which also includes the local Fox and ABC affiliates). 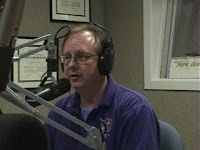 He assigned reporter Frankie Jupiter to do a story on the topic, which included an interview with me conducted at the Ix Building studios of the Newsplex. Jupiter also interviewed a local sporting-goods store owner, and he pointed out that swimming trunks are tax-exempt, but swimming goggles are not. (I had pointed out, in my article and the interview, that dancer's clothing, like leotards and tights, is tax-exempt, but ballet and tap shoes are not.) Jupiter said he found the list of exempt and non-exempt items from a link in my Examiner.com article and was amazed at the complexity and inconsistency. The first day of school is right around the corner, which means back to school shopping, and this weekend in Virginia you can do yours tax free. But Rick Sincere, a local blogger, says the rules on what is tax free and what isn't are way too complicated. "A lot of the things on the list that are tax exempt have no relation to school at all. Wedding dresses, now if you can find a wedding dress for less than $100 you deserve a lot of credit," said Sincere. And items such as printer paper, printer ink and zip drives are not tax exempt. My article for Examiner.com is headlined "Virginia’s school supplies ‘tax-free holiday’ more complicated than necessary" and can also be found through Google News.